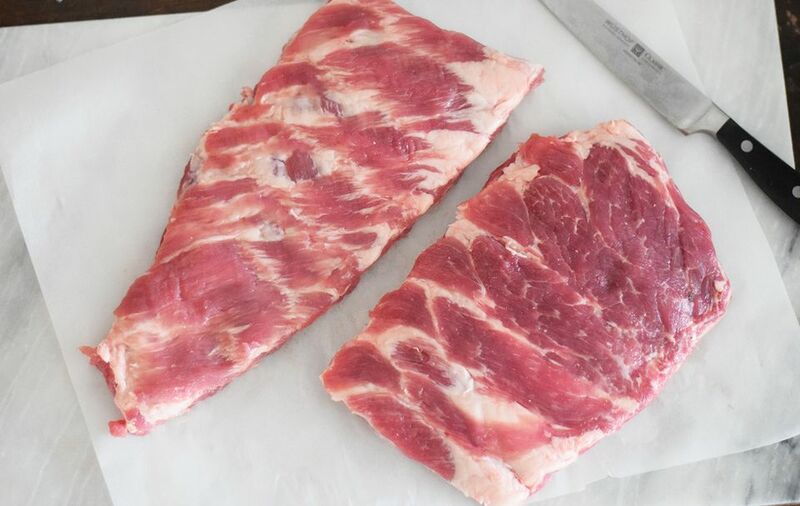 Once you familiarize yourself with pork ribs and know how to trim them, you will be able to smoke or grill delicious barbecue ribs without any trouble. The typical rack of pork spareribs has a lot more than just the ribs. The actual rib section, what you might get at a restaurant or see in barbecue competitions, is a portion of the whole spare rib area. There are three parts of the full spare rib rack. The pork rib section is what you're most interested in, but you should also become familiar with the other two parts: the skirt and the rib tips. The skirt (or skirt meat) is the flap that sits in the middle of the rack on the back side. If you don't trim it away before cooking, it will burn and cause the ribs to cook unevenly. The rib tips lay on the bottom edge of the rack. This is basically the base of what would be the pork brisket. It contains cartilage as well as the sternum, which makes it cook differently and carving more difficult, so this portion also needs to go. The first step is to take a good look at the full rack of ribs. The top side of the rack is the side with the meat. The back side of the rack is the side where you can see the bones and where all the work is going to take place. But before you flip this rack over, get a feel for the length of the bones and the point where the ribs stop. On the back of the rack, you can see the skirt clearly. You can also see the membrane which you will remove shortly. The back side of the rack contains all the parts that need trimming, so this is where you will perform all the tasks. Place the rack back side up on a cutting board to begin trimming it into a beautiful rack of ribs ready for the smoker or grill. The skirt is a thin strip of meat the runs along the membrane line on the back (or bone) side of the ribs. With the skirt intact, the rack is twice as thick at this point, which means this section will cook much slower. This is why it is necessary to trim off the skirt. This is easily done by laying a knife along the rack of ribs and cutting the skirt completely off. Save it for later. Make sure the ribs are even across this section of the rack once the skirt is removed. 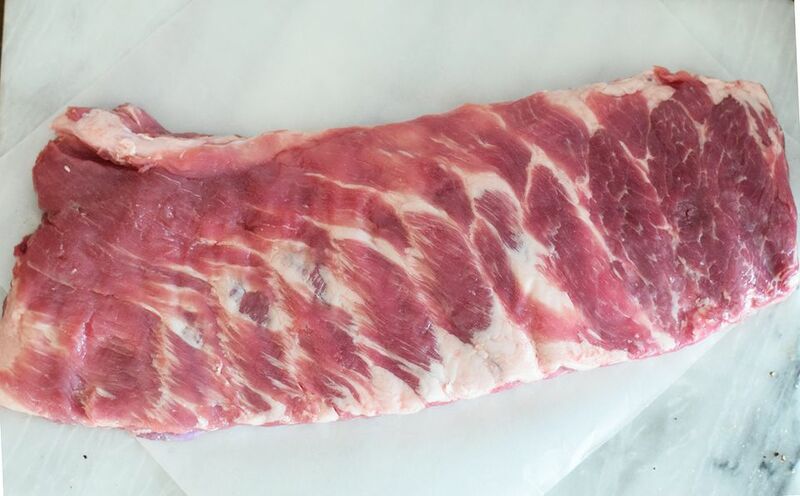 You can see the membrane as a dull, white film over the rib section of the rack. The rib membrane is a waterproof film that separates the chest cavity of the hog from the muscle/rib area. It keeps virtually everything from passing in or out of the chest area. When cooking ribs, this means that it keeps out smoke and seasonings and holds in the fat that needs to be rendered. This is why many cooks remove the membrane. Some cooks claim it doesn't matter whether you remove the membrane, so it is a matter of choice whether you do so. It is easy and quick to do, taking only a few seconds once you can get a good grip on it. As you look at the membrane you will see that it has one long triangular piece. With your knife, lift up this corner of the membrane, then take a paper towel and get a good grip on the membrane. Pull straight up and away from the rack of ribs. Watch carefully to make sure it doesn't start to split up. Once you get the hang of this, you will be able to pull the membrane from a rack of ribs in a couple of seconds. When cooking a rack of ribs, you want it limited to the actual bone section of the ribs. Well above the ribs (or below if you're looking at the pig) is a section of meat filled with cartilage, little bones (the chine bone), and connective tissue. You can identify this area with one basic rule: bones don't bend. If you try to fold the ribs in half lengthwise like a tall book, you will get a good idea where these sections meet. You can also find it by looking for a long line of fat that runs lengthwise along the rack. This doesn't always help because you can't always find it. The biggest problem with this step is that the point of separation between these sections is not a straight line, but if you stick to the rule (bones don't bend), you will have no trouble locating and cutting away this rib tip section. Now, you have a rack of just ribs. Your newly trimmed rack of spare ribs is now three pieces of meat. You are likely planning to smoke or grill the ribs. As for the other pieces, these are great morsels of meat that you can use in other dishes (on some racks this is actually a lot of meat). Prepare the rib tips and serve them as appetizers. You can also grill them relatively fast, cut them into bite-sized pieces, apply ​barbecue sauce, and serve before the actual rack comes off the smoker.